Bret Boone begins Indie coaching career. The Seattle Times is reporting that former Mariners star Bret Boone is taking a managerial job with the Victoria Seals of the Golden League. The team is located in British Columbia, so the 40-year-old Boone may be in a perfect position to draw fans in the Pacific NW to indie baseball this summer. Boone’s position with the Seals marks his first foray into professional baseball management. The Seals open their season May 21. The Golden Baseball League is an independent league featuring nine teams, from Calgary to Tucson. Is it just me, or is Boone looking a bit Cal Ripkenesque in this particular photo? A few days ago, I reported a tidbit of news about Japanese baseball star Eri Yoshida, who will be joining the Yuma Scorpions for the Arizona Winter League season. Turns out she’s not going to be the only woman joining the pros in the Golden League this winter. 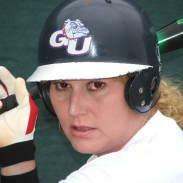 Former Gonzaga softball player Tiffany Brooks let me know that she’ll be there as well. I was pleased when she agreed to be interviewed for Bus Leagues, and I hope those of you who get a chance will head out to see some Arizona Winter League action and cheer Tiffany and her teammates on. Here’s our conversation, which was conducted via coast-to-coast email as I was digging out from the east coast’s Snowpocalypse ’09. We talked about why she wants to play baseball instead of softball, what she hopes to accomplish in her first crack at professional baseball in the U.S., and how young girls can realize their athletic dreams. Bus Leagues: How did you connect with the Arizona Winter League? Tiffany Brooks: I was looking for tryout opportunities for pro baseball, and because there is an ancient (1952) and silly ban on women in the MLB, that meant I needed to focus solely on Independent Professional Baseball for now and originally started exploring the Continental League because of its expansion. I explored a few options, and was excited to get a call from the Joliet Jackhammers (Northern League), but there was no follow-up, so I started exploring other options where I could showcase and see what might happen. The Arizona Winter League (Golden Baseball League) is the best-established and best-attended by scouts, so I contacted Stephen Bedford and asked if women were welcome. He contacted the Commissioner, Kevin Outcalt, and although they both said it had never been done before, I got back an immediate and warm invitation. The Commissioner, by the way, has been amazing and supportive of my participation in the AWL. What are your goals for the winter session? Well, as you might imagine, like any ballplayer, my dream is to win a contract with someone. I’d love to play in the GBL because I live in the West, but would be happy to go literally anywhere to play. I’ve played in Holland in the amateur portion of the Dutch League and speak Spanish and a little Japanese, so who knows? Beyond my personal goal to win a professional contract and fulfill a lifelong dream of playing pro ball, I do have some other large-scale goals. I’d say number one would be to play well, help my team and play the game the way it is meant to be played – to show that women who have a talent and love for the game and are willing to live, eat, sleep, and sweat baseball, if given the proper training and opportunities, CAN play baseball with the men at the professional level. In this way, I sincerely hope to help pave the way for women’s participation in pro baseball here in America, and throughout the world. Lastly, I hope to hone my own skills through professional-level instruction, and through the process of raising the level of my game, learn instructional techniques I can bring back and share with women and girls who want to play baseball! Do you meet many other women who want to play baseball instead of softball? World-wide, baseball is much more popular with women than softball is, so yes, in my travels playing ball, I meet women who want to play baseball all the time! Here in the US, I’m meeting an increasing number who suddenly realize that playing Baseball is an option – that they don’t have to play softball unless they want to. They’re both great games, and I did play abroad on pro contracts in softball before realizing that my lifelong dreams of playing pro baseball might have a chance to come true! 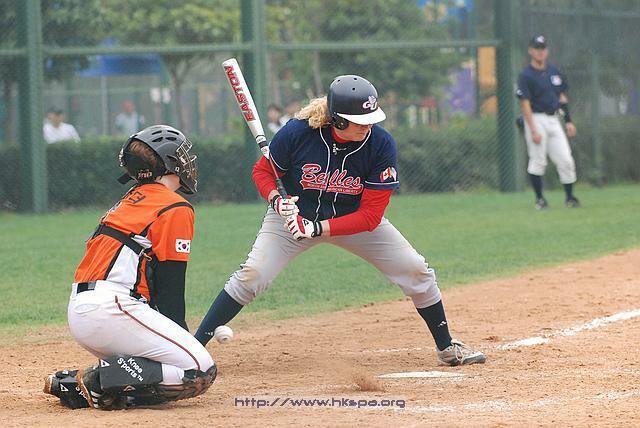 In the US and Canada there are many, many women playing baseball right now – some in women’s-only tournaments, some playing in men’s amateur leagues, and some in both – who have realized their dream to keep playing baseball. Now it’s time for the next step – to integrate women into professional baseball, and give them the pathways to develop the skills necessary to get there. You plan to room with Eri Yoshida in the AWL. Have you spoken to her yet, or will you meet for the first time when you get to Yuma? I heard the initial plan is for us to room together. I haven’t spoken with Eri, so we’ll meet for the first time there. We should make for some interesting photo opps, as she’s 5′ and I’m a 6 footer with quite a lot of muscle. Eri is quite well known in Japan and has created quite a media buzz, so I’m not sure if rooming together is a done deal or whether we both may need some space for media and quiet time. Regardless, I look forward to meeting her, working together to help promote women’s baseball, and hopefully for some great cultural exchanges. Why do you think softball became the more common sport for women to play? That’s a complicated question, and not without some political implications. Softball was originally invented to be played indoors for factory workers (mostly all men) to have something to do during the winter months in places like Chicago. Many were baseball players at various levels in good weather and wanted to keep playing something with a stick and a ball when it was too cold or snowy outside. In those days, the ball actually was “soft,” so that shorter distances could be used indoors without damaging walls, factory equipment, and yes, players. Nowdays the ball of course is anything but soft…equally as hard (if not more so) than a baseball. How did it become a “women’s” sport (don’t tell that to the US Men’s National Fastpitch team, by the way!)? According to the synopsis of Jennifer Ring’s book Stolen Bases: Why American Girls Don’t Play Baseball, “In the early twentieth century, Albert Goodwill Spalding–sporting goods magnate, baseball player, and promoter–declared baseball off limits for women and envisioned global baseball on a colonialist scale, using the American sport to teach men from non-white races and non-European cultures to become civilized and rational. And by the late twentieth century, baseball had become serious business for boys and men at all levels, with female players perceived as obstacles or detriments to rising male players’ chances of success.” If this is truly the case (along with Commissioner Ford Frick‘s ban of women in professional baseball in 1952), then it becomes fairly clear that pathways to pro baseball were no longer open, and many women who loved to play baseball got channeled into the “other” sport with a stick and a ball. Since then, of course, women have taken softball to the Olympics and into their own pro league, competing as highly-skilled athletes. I think the harder answer to this question is that although all women CAN play baseball, just like men, not all of us have the genetic, physical attributes to play at the pro level, and given the lack of opportunities for women to advance their baseball playing abilities (it’s still a huge fight to play baseball in High School, College, or American Legion/Travel Ball), it’s rare to find a woman with not only a passion for the game, but the physical attributes and training necessary to play alongside men in professional ball. Hopefully that will change soon, as opportunities expand and girls and women are once again given the chance to dream about playing in the Big Leagues. How did you first fall in love with baseball? That’s almost like asking a fish how it first came to swim! I fell in love with baseball from the first moment I laid hands on a ball and glove. I started playing at age 4 in tee-ball and have played baseball or softball ever since. I was forced out of baseball at age 15, but returned to it after a career in Softball. There is something magical about every single time you step on the field. I think it’s a form of religion, a type of religious ritual. Those stadiums we get to play in sometimes are Cathedrals. They are our Notre Dames. High School fields are chapels…but sacred nonetheless. They are like holy places to me – and to most other ballplayers I’ve talked with…well, they feel the same. Was it easy to find a game when you were a kid? I grew up dirt poor, so I played wherever and whenever I could. We always found a way to play – pick-up games, in the street, whatever. I grew up rurally, so when there was no one around, stop signs and trees became catchers, tree limbs became bats, and there wasn’t a rock or dirt clod in sight that was safe. I would also sit for hours at a time and throw a tennis ball at a concrete wall. As for playing on boys’ teams, I was very well accepted until about age 13. Then although I was still bigger than a lot of the boys, things started to change. My teammates respected my playing from age 13-15 when I played, pitched and hit well, but other teams began to put the pressure on my own teammates. Eventually, the pressure built and I was forced into Softball. Nevertheless, I was an all-star from age 8-15 at 1B and as a reliever. You played in college. Are you worried that the current financial crunch in higher education might kill off some opportunities for women to play softball/baseball? Great question. Yeah, the current financial situation is tough on schools, especially with sports programs. I think it could be a two-edged sword. On the one hand, the NCAA has recently ruled that baseball and softball are NOT equivalent sports, so no longer can women be funneled into Softball if they want to play Baseball. The ruling and the reality are two different matters of course, but it’s a big step in the right direction. So, if a school were to eliminate softball, then the girls could possibly swell the ranks of baseball. On the other hand, if baseball and softball are both eliminated due to financial problems, then of course, ALL ballplayers are hurt. One side effect I’ve seen is that travel ball seems to be growing as the school programs are suffering financially. This may be good for girls who want to play baseball, but it’s too early for me to tell what will happen. I hope for the positive for all – for girls who want to play Softball to keep having the opportunity, and for girls who want to play Baseball, for them to have an open door to prove themselves and keep playing the game they love. You’ve traveled quite a bit as a player. Where are some of the most exciting places you’ve gone around the world? I’ve had the tremendous opportunity to play in many places, and that’s been made possible by all my coaches who gave of themselves selflessly over the years, by my present sponsors, Akadema, The 90 MPH Club, 3n2Sports, Gold’s Gym, Birch Bats, and Dr. Pirie at the Spokane Eye Clinic. I couldn’t do it without their support and the support of all my friends and family who have been patrons, patronesses, and just plain great. I’d say I’ve loved to play everywhere I’ve had the opportunity. 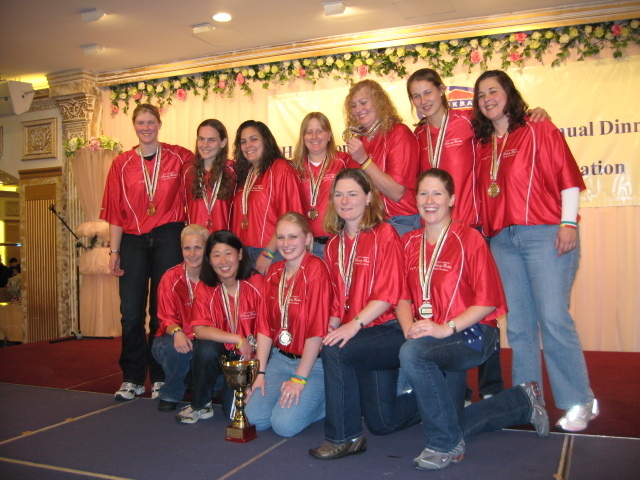 For baseball, playing in Hong Kong, China has probably been the most exciting…playing with women from all over the world and competing for the gold twice there has been one of the greatest experiences of my life. Playing baseball in Holland, a the only female ballplayer in the league was amazing… my coach there, Quansio Quant, my catcher, and all the guys were tremendously supportive. In softball, I’d say playing in Australia and the Czech Republic…both were pretty exotic places to get to play, and although the Aussies might not think it’s exotic, watching a dozen wallabies hop off the practice field and being run off the field by an Aussie Brown (deadly) snake seem pretty exotic to me! Do you have a signature pitch you hope to impress with this winter, or do you expect to see more time in the field? I’d say we’ll have to wait and see. This will be a good test for me. I’ve played at the amateur level with guys about as far as I can go, and with women, about the same at international competition. I have six pitches I throw, and I’m hoping at least a couple will give the guys some trouble. I’ve been hitting well at the amateur levels (wood bat), but again, this is quite a leap in level. I’m pretty sure I can compete defensively with my glove at 1B, but we’ll have to see where my strengths lie. The main thing is whether it is with my arm as a relief pitcher or with my glove and bat, I want to help my team and do honor to the game by playing it the best I possibly can. What would you say to young girls out there who love baseball but have limited opportunities to participate on a team level? I’d say do not give up! If this is the game you want to play, don’t take “no” for an answer. You’ll need to have thick skin on some of the teams, even at the teenage and adult levels. Shake off the negativity like a duck shakes off water. Practice your game. Train. Get strong… get just as strong as the guys. Don’t be worried about image…if you love the game, do whatever it takes to be successful. Practice at least 6 days a week, and think about the game every day. Believe in yourself and be the best player on the field. Play Hard and Dream Big! Generally speaking, I’m not a big fan of having my heart warmed. That usually means someone is going to toy with my emotions somehow. But I’ll make an exception for Josh Faiola, the Frontier League player who stayed in an old folks’ home this season. I guess the Annie Savoy situation is just a fantasy. What do you think it would be? I mean, Roger Clemens struck out 20 twice. Kerry Wood struck out 20 and nearly added a no-hitter to the equation. While these performances are admittedly great, there’s someone this decade who blew them out of the water. Someone went and struck out 25 batters. That was his debut for the London Werewolves in 2000. It got him a contract with the Reds two days later. His career with the Reds, for someone who never actually reached Triple-A? It was pretty good. He ended his run in the Reds organization with a 2.91 ERA working mostly as a reliever. He ended his in game career in Schaumburg working double duty as a player coach. In 2005 he had his last professional in game action at Alexian Field. But his career did not end there. And that is why at BLB salute Brett Gray. Tough enough to pitch for national pride. Skilled enough to strike out 25 in a single game and get an ERA under 3 in the minors. He’s one of the unsung pitchers of the decade. And before I forget? Yes, I know the story of Ron Neccai. He did strike out 27 batters in a game. That being said? How many people get the win, 25 strikeouts, and their best man all in one night? I didn’t think so. Memphis Redbirds 9/7/09 Colby Rasmus – First 1,500 – Great way to cap off the Redbirds season by giving one of its budding future Cardinal studs. Reno Aces 9/7/09 Aceball – First 3,000 – The fan vote bobblehead in Reno features the mascot who appears when homers are hit. Lowell Spinners 9/8/09 Extreme Blue The Frisbee Dog (Mascot) – First 1,500 – The regular season didn’t have any days left from this earlier rainout for this promo so they saved it for their playoff run. Pittsburgh Pirates 9/8/09 Arnold Palmer – The Pirates celebrate the 80th birthday of this Latrobe, PA golf legend. West Michigan Whitecaps 9/10/09 Jeremy Bonderman – First 1,000 – The Whitecaps have made a habit of playoff bobblehead giveaways, and this one features Bondo in a special jersey. Arizona Diamondbacks 9/12/09 Augie Ojeda – First 25,000 – When the D-Backs traded Tony Pena to the White Sox, all hell broke loose in the Arizona bobbleworld. Ojeda was moved up to this day, which was originally scheduled to be Tony and Ojeda’s runner up was added as a final giveaway later on this month…Stay tuned. Houston Astros 9/12/09 Jose Valverde – First 10,000 – Another animated closer bobblehead showing his tarzan-like antics upon celebrating a save. Minnesota Twins 9/12/09 Jim Kaat Bronze Statuette – First 10,000 – Kitty still isn’t bronzed in Cooperstown but that hasn’t stopped the Twins from doing it at the Dome. Detroit Tigers 9/13/09 Paws (Mascot) – All Kids 14 and under – This marks the first time the lovable tiger mascot is available as a giveaway at an MLB venue. Florida Marlins 9/13/09 Hanley Ramirez – First 10,000 – When it comes to giving current Marlins out as figures, nobody comes to mind more than Han-Ram. I’d also like to thank Southern Maryland BlueCrabs GM Chris Allen for the great hospitality Saturday night along with the Brooks Robinson and Roofman past giveaways. Good luck in the playoffs pal.